We conducted a 17-year nationwide survey (1999–2015) to elucidate the clinical outcomes of patients with primary myelofibrosis (PMF) in Japan. Questionnaires were sent annually to approximately 500 hematology departments. Newly diagnosed patients with PMF were enrolled in this study, and were followed up annually to collect prognostic information. Approximately 50 patients were enrolled per year, yielding a total of 780 patients with PMF included in this study. The median age at diagnosis was 66 years. At the time of analysis, the median survival duration was 47 months, and the 3-year overall survival rate was 59 %. Infection and disease transformation into acute leukemia were the most frequent causes of death. Of the proposed prognostic models for predicting the outcomes of PMF patients in Japan, the Dynamic International Prognostic Scoring System of PMF plus model was the most feasible. Forty-three patients received allogeneic hematopoietic stem cell transplantation (alloSCT) at a median of 343 days after diagnosis. This treatment significantly prolonged the survival of PMF patients, and the 3-year overall survival rate after first alloSCT was 84 %. A long-term registration study is required for further evaluation of prognosis and the impact of treatments on survival. The online version of this article (doi: 10.1007/s12185-016-2102-3) contains supplementary material, which is available to authorized users. 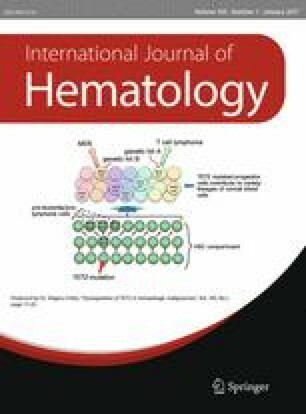 This study was supported by a research grant from the Idiopathic Disorders of Hematopoietic Organs Research Committee of the Ministry of Health, Labor and Welfare of Japan (H23-Nanchi-Ippan-001, H26-Nanchi-Ippan-062, H27-Nanchi-Ippan-017, a Grant-in-Aid for Scientific Research (C) (to K.T., No. 26461424), and a Grant-in-Aid for Scientific Research (S) (to K.A., No. 16H06391). The authors are grateful to their collaborators for their valuable contributions and acknowledge all the institutions that participated in this study and are listed in the supplementary document.